Also serving communities of Sheffield Lake. There are 43 Assisted Living Facilities in the Avon Lake area, with 2 in Avon Lake and 41 nearby. The average cost of assisted living in Avon Lake is $4,750 per month. This is higher than the national median of $3,346. Cheaper nearby regions include Avon with an average starting cost of $3,495. To help you with your search, browse the 236 reviews below for assisted living facilities in Avon Lake. On average, consumers rate assisted living in Avon Lake 4.7 out of 5 stars. Better rated regions include Elyria with an average rating of 4.9 out of 5 stars. Caring.com has helped 8 families in Avon Lake find high-quality senior care. To speak with one of our Family Advisors about assisted living options and costs in Avon Lake, call (855) 863-8283. Avon Lake is situated on the shore of Lake Erie just 15 miles west of Cleveland and 10 miles east of Lorain. The population is just over 24,000, with 17.2 percent of residents over 65. These seniors are served by two assisted living facilities within city limits and 40 in the surrounding areas. 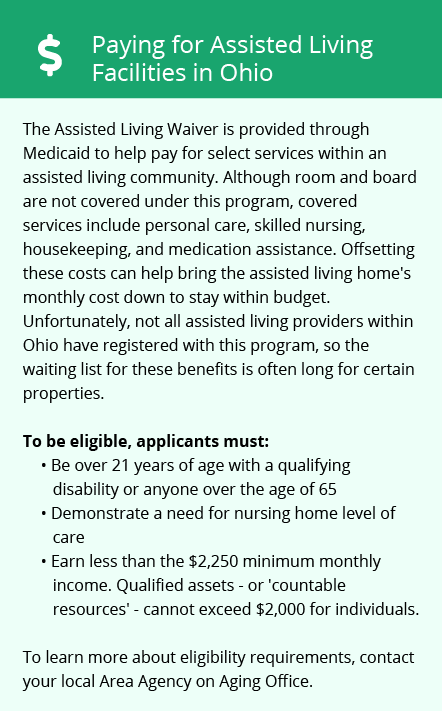 These communities are licensed by the Ohio Department of Health, which defines them as Residential Care Facilities, and provide a homelike setting and personal care services. Seniors can find plenty of entertainment options in Avon Lake and the surrounding area, including Miller Road Park, Klingshirn Winery and Lake Erie Nature & Science Center. The Old Firehouse Community Center provides seniors with activities such as fitness and health programs, movies and games. The cost of living in Avon Lake is 5.7 percent higher than the U.S. average. This is primarily due to housing, however, as grocery, transportation and health care costs are all under national medians. The climate in Avon Lake is seasonal. Summers are warm, with average highs of 81 degrees Fahrenheit in June, but winters can be quite cold and windy, with lows of 21 degrees in January. Snowfall is twice the U.S. average at 52 inches per year. This may affect seniors who enjoy outdoor activities. Seniors can feel safe living in Avon Lake, as the crime rate is low. The city is safer than 91 percent of U.S. cities, and violent and property crimes received low scores of 25.8 and 26 out of 100 (high crime), respectively. Seniors who cannot drive can access the Old Firehouse Community Center’s curb-to-curb service, a free transportation program that runs four days a week. There are no public buses directly in Avon lake, but Lorain County Transit offers paratransit service to medical appointments, shopping and social activities within 3/4 mile of an existing bus route in Lorain County. Avon Lake has an array of community resources for seniors, including the Lorain County Council on Aging, an organization that provides services such as transportation assistance, dining and food programs, support services and education, as well as one senior center. Assisted Living costs in Avon Lake start around $4,750 per month on average, while the nationwide average cost of assisted living is $4,000 per month, according to the latest figures from Genworth’s Cost of Care Survey. It’s important to note that assisted living rates in Avon Lake and the surrounding suburbs can vary widely based on factors such as location, the level of care needed, apartment size and the types of amenities offered at each community. 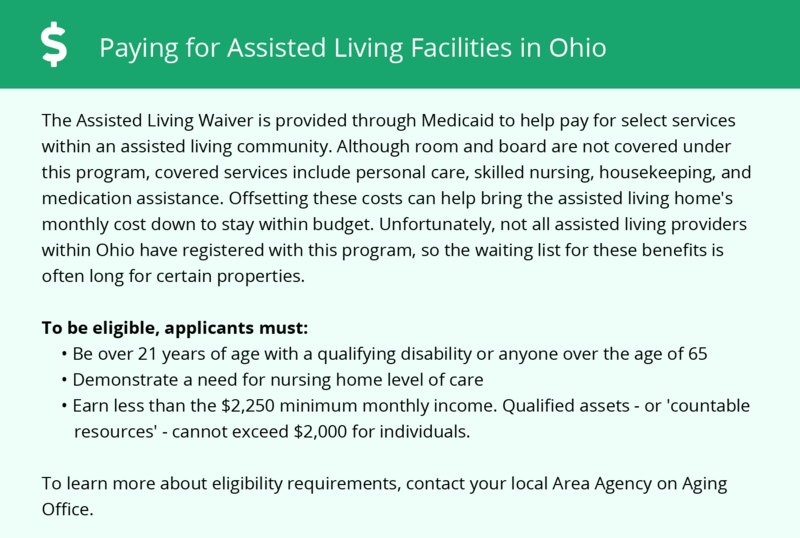 Ohio’s Assisted Living Waiver Program can help seniors in need of financial assistance for assisted living in Avon Lake. The PASSPORT Medicaid Waiver program is also an option that helps seniors pay for other services, such as assistance with daily living activities. Avon Lake and the surrounding area are home to numerous government agencies and non-profit organizations offering help for seniors searching for or currently residing in an assisted living community. These organizations can also provide assistance in a number of other eldercare services such as geriatric care management, elder law advice, estate planning, finding home care and health and wellness programs. To see a list of free assisted living resources in Avon Lake, please visit our Assisted Living in Ohio page. Avon Lake-area assisted living communities must adhere to the comprehensive set of state laws and regulations that all assisted living communities in Ohio are required to follow. Visit our Assisted Living in Ohio page for more information about these laws.